The Bolsheviks unite with Soviets established in various Russian cities to take control of the government in the October Revolution. 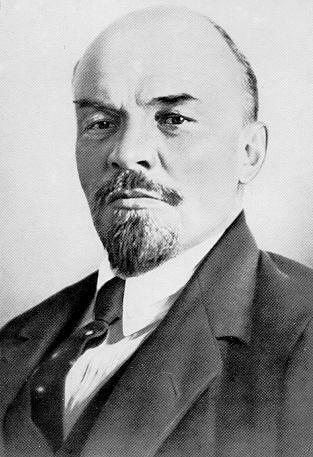 Trotsky and Vladimir Lenin (below) are architects of the revolution. The Second All-Russia Congress of Soviets leads to the creation of the Russian Federated Soviet Socialist Republic. A peace settlement is reached with Germany. United States enters the war. 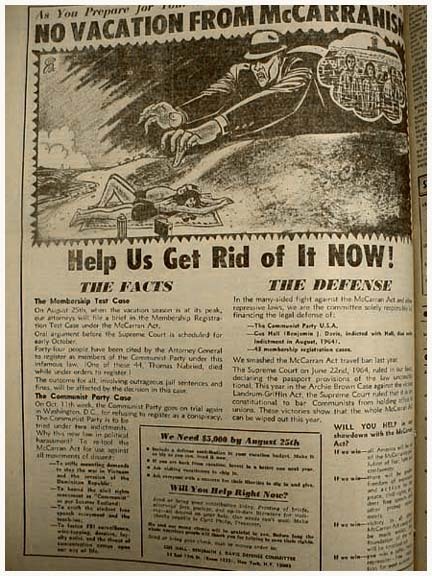 First “Red Scare” in the US; radicals, socialists and IWW members are targeted in raids. Armistice in the Great War. February: The first city-wide strike to occur in the United States begins: the Seattle General Strike. March: First Communist International (Comitern), composed of Communists and radical socialists from around the world, including the United States , meets in Moscow. In the United States, socialists aligning with the Comiterns pledge allegiance to the revolutionary overthrow of the capitalist system, break from the Socialist Party of Eugene Debs to form the Communist Party of America and the Communist Labor Party, which later merge. November: An IWW hall is attacked by military veterans during an Armistice Day parade in Centralia. Five veterans are killed by gunfire; a mob breaks into the city jail and pulls out the perceived IWW leader, who was hanged, shot and mutilated. 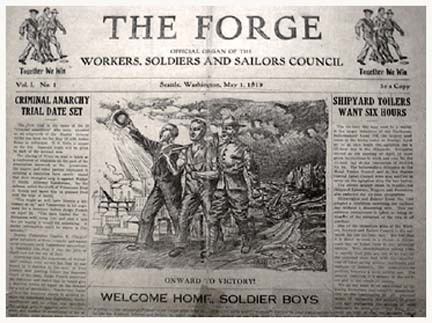 The state of Washington passes a law banning the IWW. In a subsequent trial, seven Wobblies are convicted of murder. 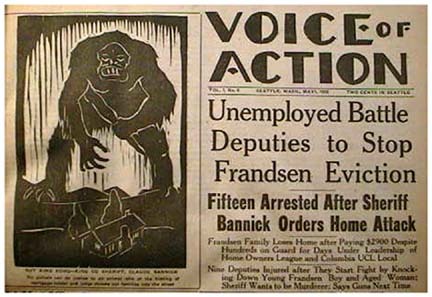 Continued persecution of Communists and “reds,” including the IWW. The Ku Klux Klan stages massive rally in Issaquah on July 26, attended by an estimated crowd of 13,000. Joseph Stalin adopts the principle of socialism in one country, a departure from the doctrine of the earlier Internationals. CPUSA launches Unemployed Councils, calls for unemployment insurance, seven-hour day, and recognition of Soviet Union. The state’s Joint Legislative Fact-Finding Committee on Un-American Activities is set up to investigate the influence and presence of Communists in state politics. In landmark case, US Supreme Court rules that Cannery Union officers cannot be deported. 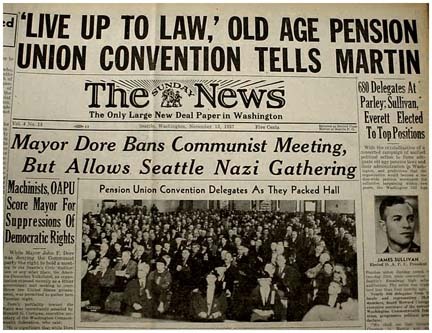 Seven union and civil rights activists in Seattle are charged with conspiracy for attending Communist Party meetings under the Smith Act. 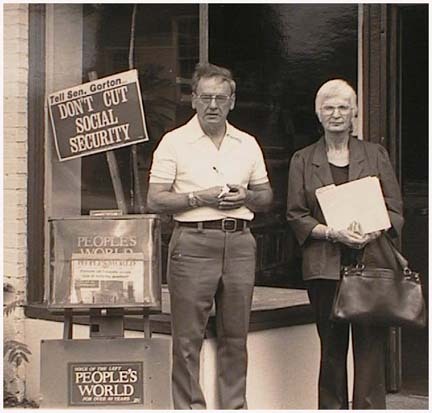 The seven include established leaders of the Communist Party in Washington - Henry Huff, John Daschbach, William Pennock, Paul Bowen, Karly Larsen, Terry Pettus and Barbara Hartle. Milford Sutherland runs for Washington State governorship. BJ Mangaoang lauded in Seattle newspaper for her leadership. She reports less than 200 Party members State-wide. 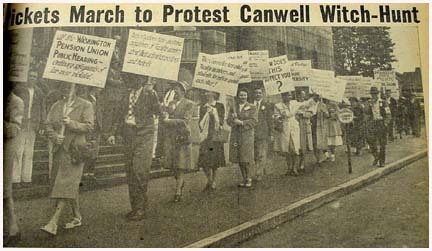 Mark Jenkins play, All Powers Necessary and Convenient, examining the 1948 Canwell Committee hearings is staged by UW.